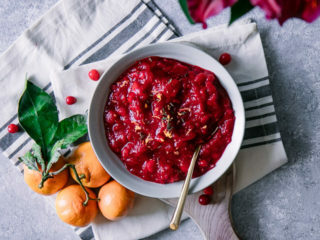 Maple Bourbon Cranberry Sauce, a simple homemade cranberry sauce topping made with fresh cranberries, bourbon, maple syrup, oranges, cinnamon, and fresh thyme. An easy twist on the Thanksgiving favorite! 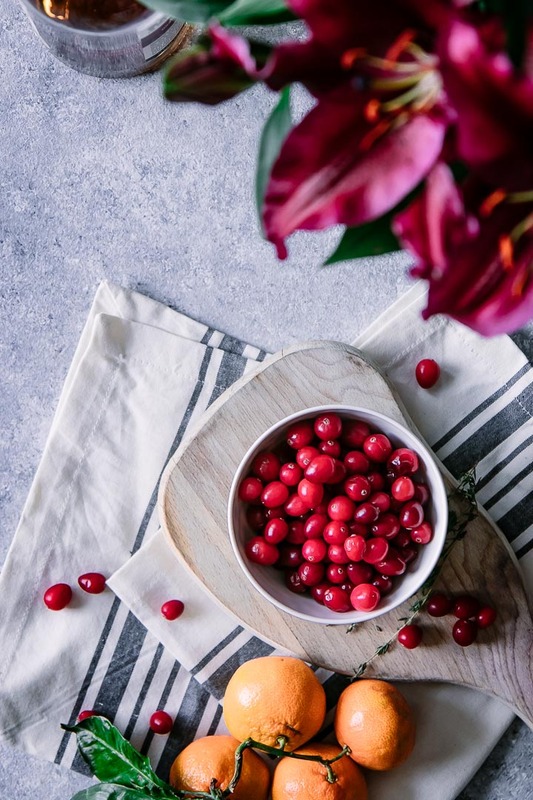 Are you a fan of cranberry sauce at Thanksgiving dinner? I have to admit that as a child I was never a fan. Maybe it was that it usually came pre-made from a can, but I always passed when the wobbly cranberry sauce bowl was passed around the holiday table. Until I fell in love with cranberry sauce made from scratch with fresh cranberries. The tart berries take on a different flavor when heated, and their strong flavor pairs well with sweet orange juice, a drizzle of maple syrup, and a splash of bourbon. All the fall American flavors! 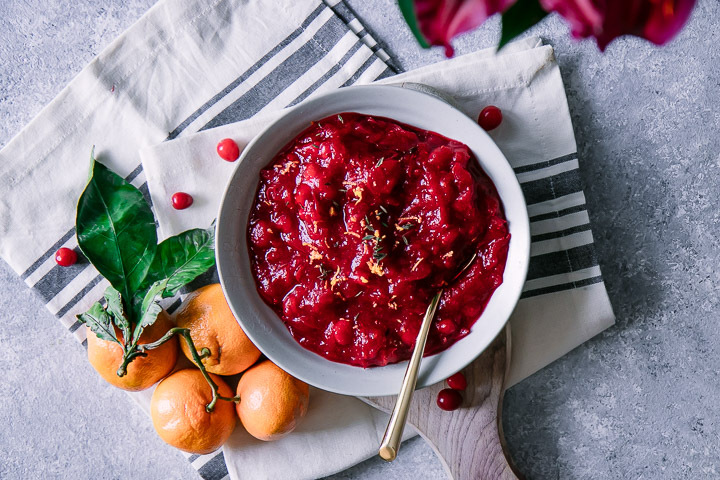 This Maple Bourbon Cranberry Sauce is now our favorite homemade cranberry sauce recipe for Thanksgiving, and with only seven simple ingredients it comes together in less than twenty minutes (did I mention it’s gluten-free and vegan?). Ready to make your new favorite homemade cranberry sauce? Let’s do it! First, combine cranberries, orange juice, bourbon, maple syrup, cinnamon stick, and fresh thyme in a medium-sized saucepan over medium heat. Make sure that the cinnamon stick and fresh thyme are covered with liquid so they release their flavors when heated. Cook slowly over medium heat until cranberries pop and cook into a liquid, about 15 minutes. When all cranberries have popped and the mixture is mostly soft, remove from heat and remove thyme sprig and cinnamon, and let sauce cool. If you like a thicker cranberry sauce, serve as is, but if you like a thinner liquid transfer to a food processor or blender and pulse until sauce is well combined. Add more juice if needed to get to desired sauce consistency. When ready to serve, top with more fresh thyme leaves and orange zest. Then enjoy over roasted turkey, chicken, on sandwiches, or even on toast. This simple cranberry sauce is a great make ahead recipe, and can be prepared up to three days before your dinner or event (Thanksgiving!) and reheated before serving. I hope you love this easy Maple Bourbon Cranberry Sauce recipe as much as we do, it’s a staple on our Thanksgiving holiday table! Craving more easy Thanksgiving recipes? Check out our Simple Creamy Scalloped Potatoes and Maple Brown Sugar Roasted Acorn Squash recipes, both easy seasonal side dishes that won’t have you stuck in the kitchen on Thanksgiving Day. 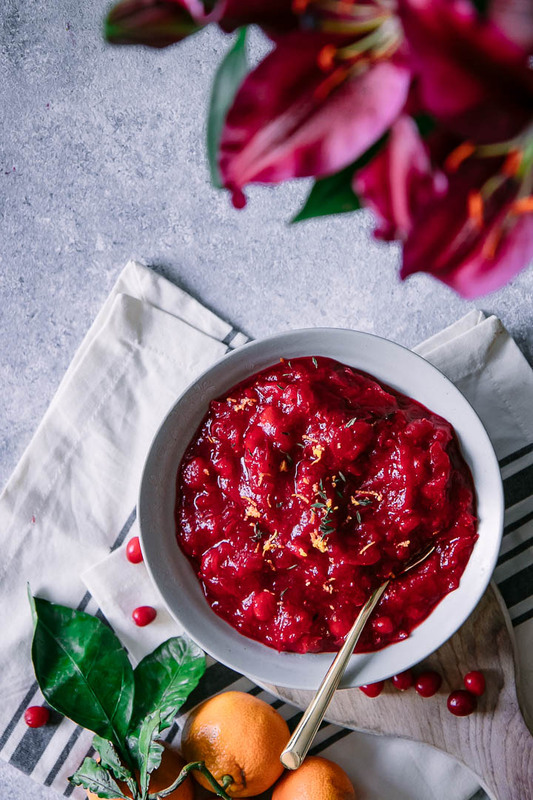 Did you make this Maple Bourbon Cranberry Sauce recipe? Leave a comment below and rate the recipe to let us know how it turned out. Save this recipe for later by pinning to your favorite fall Pinterest board and make sure to tag me on Fork in the Road’s Instagram to show me your salad creations! 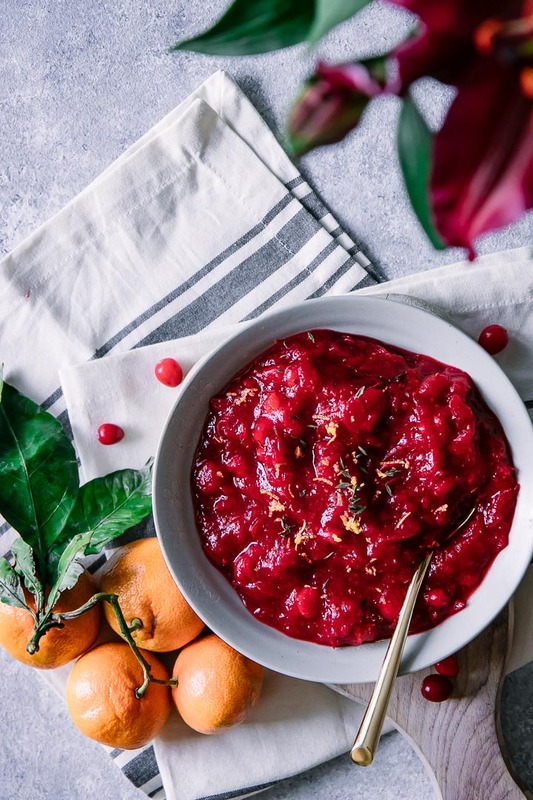 Maple Bourbon Cranberry Sauce, a simple homemade cranberry sauce topping made with fresh cranberries, bourbon, maple syrup, oranges, cinnamon, and fresh thyme. Add cranberries, orange juice, bourbon, maple syrup, cinnamon stick, and fresh thyme sprigs to medium saucepan, making sure cinnamon stick and herbs are covered by liquid. Cook on medium-low heat for 15 minutes, or until cranberries burst. Remove cinnamon stick and herbs, and allow to cool. For a thicker sauce, serve as is. For a thinner sauce, combine sauce with a small amount of juice in a blender or food processor and puree until desired consistency. Leftovers and Storage: allow sauce to completely cool and then store in an airtight container in refrigerator for up to one week. Freeze for up to two months. Nutrition: This homemade cranberry sauce is a low in calories and sugar compared to traditional pre-made cranberry sauces. I tried this for my family Thanksgiving dinner and it was really good! I’ll definitely make it again, it was super easy.